Naples is that breath of fresh air, get away from it all, type of town with everything from ecologically sound parks, to fabulous white beaches, to unique cultural attractions. Once visited this is a place that people want to return to again and again. Set off with palm and banyan trees, Naples is known for it's open air cafes and restaurants plus wonderful shopping along Fifth Street, Third Avenue South, The Village on Venetian Bay and the Waterside. 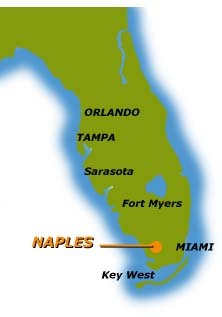 Naples caters for the golfer with over 70 courses, for the fisherman with many waterways between the 10,000 Islands, and for the nature lover with the Everglades National Park, Corkscrew Swamp Sanctuary and of course birds everywhere. This provides year round attractions in wonderfully balmy climate and of course those famous Naples Sunsets! The area has something for every age from zoos, a teddy bear Museum, boating trips and beaches for the children, to restaurants with live music, concerts, Dinner Theatre, art shows and more for the grown-ups. After a month you will only have dipped your toe into the vast amount on offer!